I wonder how many bikes are getting rusty right now in garages or in ‘patios’ in Álamos (Bogotá), a place where bikes go to die after an infringement of the law by their owner. I hope it’s not too many. With luck, some of them may end up in the hands of a mechanics’ lover who can bring bikes back to life. That’s exactly what a 29-year-old from Poland did with his bike Ukraina in a video on YouTube. Last summer Marcel K, animabusu in YouTube, resurrected a bicycle from Communist times. Or I don’t know if I better say that Ukraina rose herself from the dead –otherwise the bike might get upset. In the video she comes back to life thanks to more than five thousand pictures. Marcel also owns a mountain bike, and says that he prefers to ride his bicycle in the summer months. This self-assembling bike has got almost eleven thousand views in YouTube and Marcel expects more people will continue to view it. Where and how did you find this bike? I found it in small village near Wrocław, I was living then in Wrocław and I always wanted to have this kind old bike to ride in city. Accidently a guy who I met in my job had one for sale. 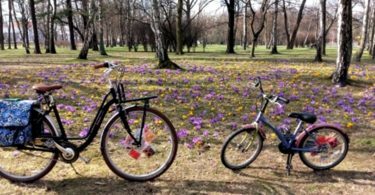 Where you ever cycling in Wroclaw? If you were, what do you think of the cycling infrastructure? How long did it take you to shoot the self-assembling bicycle video? How did you come up with the idea? Well everything started when I found this old bike and decided to restore it. I think it was three years ago. So when I prepared the parts and disassembled the bike for mediablasting and painting I found this movie on YouTube www.youtube.com/watch?v=daVDrGsaDME and eureka 😉 Then I decided to create something similar with my bike. This is my first version of the movie www.youtube.com/watch?v=5-iP-46Fc_M but it was not enough for me, so last summer I decided do it again but better. Last version www.youtube.com/watch?v=2Ly2xCJIH80 took me a month of shooting 2-4h daily, plus editing on computer. Is assembling bicycles a hobby for you? When I was younger I really loved spending my free time with my grandfather, and he taught me how to fix bikes. He was a handyman at home, and he liked building things, from watchmaking to construction of tractors. So for a young kid the world of how things work and how they are made was magical. Filming is my new hobby, I just started, and I was learning by myself from internet and books. How many shots or frames did you make? Did you use some images from you other video DIY for the self-assembling one? What difficulties did you encounter while making the self-assembling video? I made 5349 photos for this project. I had to repeat every single shot (from the first video), but some of captures and the general idea is this same like as in the first version, plus an extra new capture and more frames per second. I still see that I could do things better. I was combining two filming techniques in this project, stop motion and time lapse. I used time lapse in the second part when I ride the bike in the forest. The most difficult thing was figuring out how to attach the camera to the bike and pedal at the same time, and I was also having some hardware limitations. But I am still thinking about new filming equipment. However the most time-consuming capture was the one with the calipers on the map: every single frame was edited in Photoshop to cut out my hand. Where did you go cycling in the video after the bike was assembled? It was my hometown, a small village located middle of Poland. 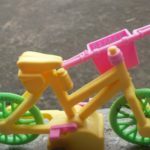 Is the self-assembled bike still working to this day without a problem? What is the bike’s brand? Yes, the bike is working 🙂 This bike was produced in Ukraine between the 70s and 90s, it was the most popular old bike In Poland, and we just called it ukraine Україна. No, just „ukraina”. But we have a funny rhyme about it: „nie pij wódki, nie pij wina, kup se rower ukraina 😉 which means „don’t drink vodka, don’t drink wine, just buy bike ukraine”.